The PubChem BioAssay Record page is now available. 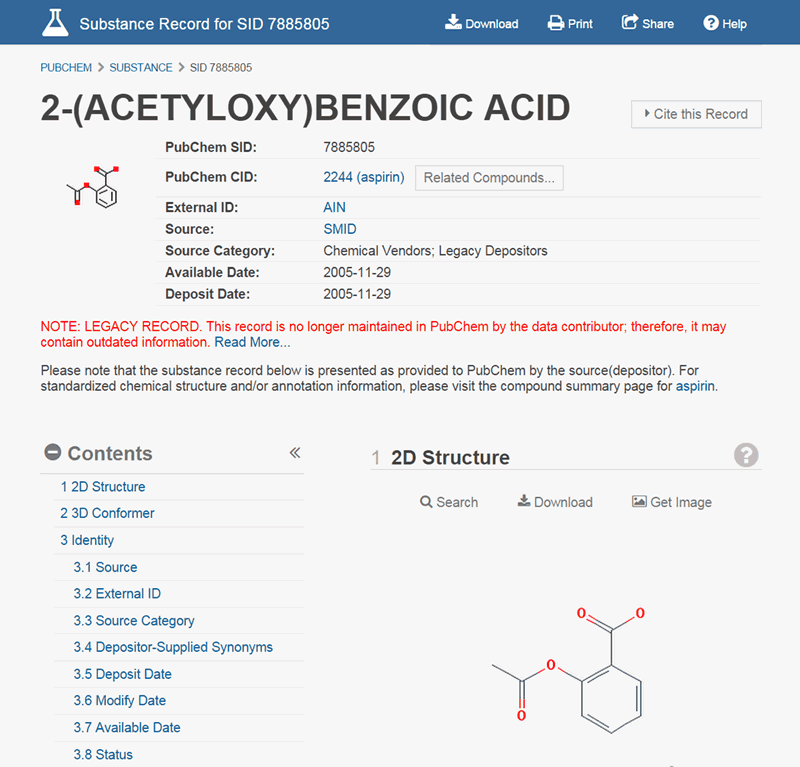 It complements a recent revamp of the PubChem Compound Summary page and the Substance Record page. What is the BioAssay Record Page? 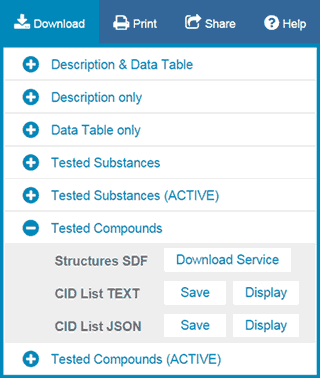 As explained in a previous post, PubChem organizes data into three primary databases: Substance, Compound, and BioAssay. The BioAssay database contains over one million biological assay experiments containing more than 229 million bioactivity outcomes. 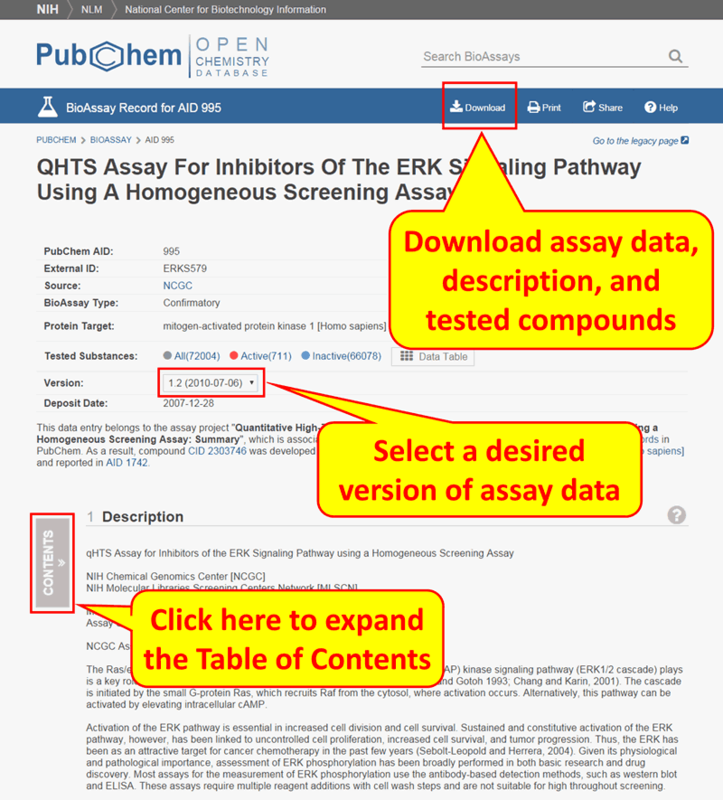 For each assay, PubChem now provides a BioAssay Record page (formerly called the Assay Summary page), which displays information provided by the data contributor about the assay as well as annotations and links to tools that support data interpretation and analysis. As with the recent update to the Compound Summary and the Substance Record pages, the new data-driven BioAssay interface is optimized for both touch- and mouse-based devices. Using a responsive design, it automatically adapts to the available screen size, making it friendly for desktops, tablets, and mobile phones. In the new BioAssay Record page, depositor-provided information is presented first, followed by annotations based on third-party curation and PubChem processing. In the now deprecated Assay Summary page, depositor-provided information was intermingled with annotations from third-party curation and PubChem processing, often causing confusion about data provenance (i.e., the information source). 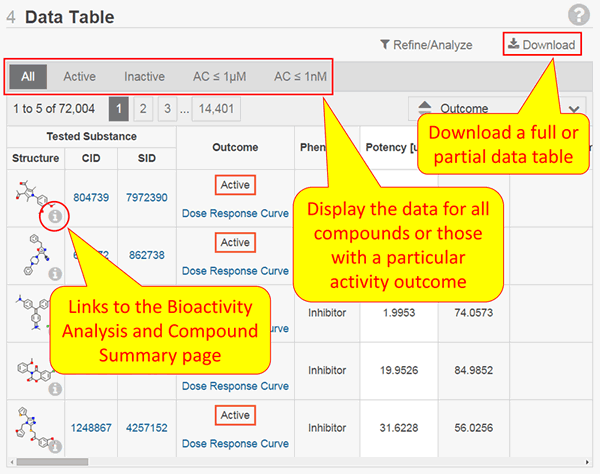 While a full bioactivity data set is retrieved by default, the data table is partitioned according to activity outcomes (e.g., active, inactive, submicromolar activity, subnanomolar activity, and so on), allowing users to quickly filter results. In addition, users can download the entire data table or a filtered subset. To support comparative evaluation, a link to a cross-assay bioactivity analysis page is provided for each compound displayed in the data table. The top bar ‘Download’ button provides access to all downloadable data on the page. This includes depositor-provided description, data table results, chemical structures tested in an assay, and annotations shown in an individual section. At the bottom of the BioAssay Record page, BioAssays from the same assay project and other related BioAssays are displayed in a tabular format, facilitating assay data interpretation and comparison. Links to the now deprecated Assay Summary page will automatically redirect to the new location for the BioAssay Record page. The now deprecated Assay Summary page will remain accessible from a link at the top of the BioAssay Record page until May 2016. A PubChem Target Summary page is in progress, helping to summarize available biological activity and annotation information in PubChem is in progress. Sometimes information provided to PubChem by data contributors becomes outdated. To address this, PubChem is introducing a “legacy” designation for collections that are not regularly updated. This “legacy” designation applies to project/contributors that appear to no longer be active, as well as to their individual records. This designation will help PubChem users quickly identify records that may have out-of-date information and/or hyperlinks. As an archive, PubChem accepts scientific data from contributors and maintains that data even if the contributing project is discontinued. While this helps ensure community access to the information lasts beyond the lifetime of a given scientific endeavor, the archival nature of PubChem does not allow anyone other than the data contributor to modify provided information. Therefore, some records in PubChem can persist with outdated (or incorrect) data. To help identify such cases, we are introducing a “legacy” indication for contributors and their records. Please note that this does not mean that data identified as “legacy” is without value. Quite to the contrary, some legacy collections successfully collected valuable scientific data for the research community, and are simply no longer updating the information. How is a “legacy” designation determined? A “legacy” designation is arrived at via a semi-manual, semi-automated procedure. It involves aspects of examining contributor account information, individual records, and user reports. For example, if the depositor website does not work for a period of time, attempts are made to contact the submitting organization. If PubChem staff are unable to make contact with the data contributor or if an organization is no longer updating records, a legacy designation may be initiated. Please note that a “legacy” designation can be removed at any time, when contact is reestablished and updates resume. If a data contributor is designated as “legacy”, all records deposited by the contributor are also designated as “legacy”. While still searchable, these records will clearly indicate that they are “legacy”. 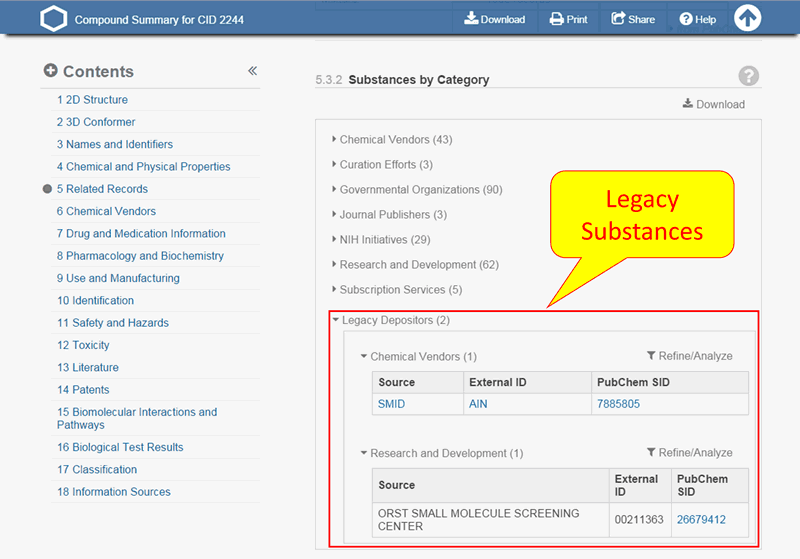 Please note that “legacy” records will not be shown in the “Chemical Vendors” section of Compound Summary pages. In addition, in the “Substances by Category” section of the Compound Summary page, “legacy” substance records only will be found under “Legacy Depositors”. The way PubChem implements both manual and automated processes to ascertain a “legacy” indication will likely evolve over time. In addition, we are looking at the possibility of enabling users to separate out legacy records when searching and analyzing the database.